Our frequency of bathing is dependent on many variables. We will often try to park close to a water source like a stream or river, this makes it easy. We can just take a dip in the water whenever we feel gross. Many towns that have a population of nomads around will have public showers, or laundromats with paid showers. We often meet awesome people on the road that open their homes to us, allowing us to take a shower on occasion or even do our laundry. Being kind and genuine to everyone we meet opens many opportunities. Lately, in the desert I’ve been using our MSR water bladder for showers. I start with my head, get all of my hair wet. Then rinse the rest of my body, switching hands to get either side of my body. Once I’m all rinsed off and wet, I’ll lather up with some Zum soap or Dr. Bronner's. Then rinse off again with the water bladder. This makes for a great shower. I try to do this while the sun is still out, drying off naked in the wilderness is an exhilarating feeling. If we want to, we can lay the black MSR bladder out in the sun to warm the water, but I honestly prefer the cold water to zap my body and mind back into the moment. If you haven’t tried cold showers, give it a go. Also, look into the Wim Hoff method and science around cold exposure. When I go mountain biking, climbing or do any sweat inducing activity, I have to think about how I’m going to wash off the gnar. At the end of a ride, if a stream is nearby I’ll strip down to my boxers and get a quick dip in. Frequency of showers depends on our activity level, climate and humidity. Often we can lengthen the time between actual showers by wiping down with baby wipes. We’ve found that we can rip the baby wipes into thirds, one third of a wipe is enough for a good I am Legend shower. 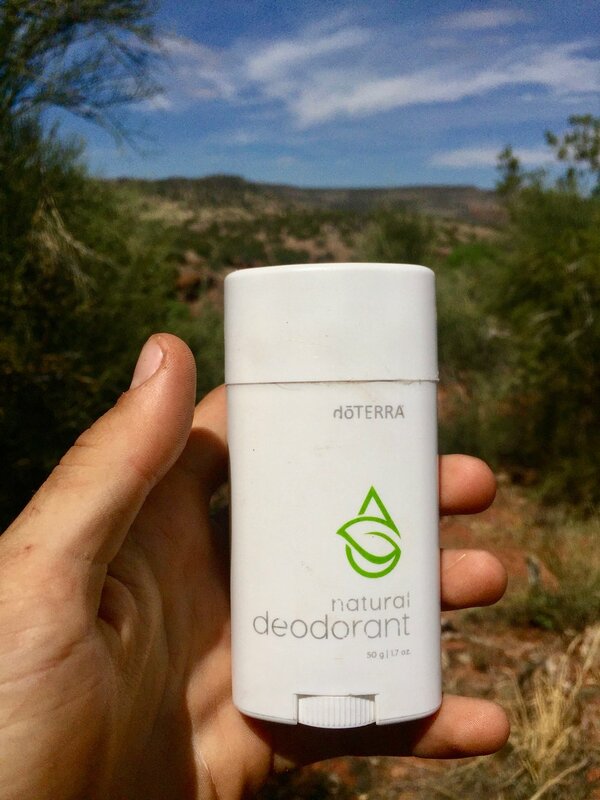 I’ve become quite the deodorant connoisseur in nomad life. I’m not a fan of antiperspirants, because the body sweats for a reason. I’ve tried many different deodorant products. The ones with baking soda irritate my pits. The two types I’ve liked the most are from two different multilevel marketing companies, funnily enough. One is the Young Living brand and the other Doterra. The base of these deodorants is coconut oil and bees wax. These are scented by a mix of essential oils, smells good on guys and girls imo. Neither has the locker room testosterone fist pump scent that many deodorants do. Only issue with these deodorants is their price. But these little sticks go a long way. I generally use about two swipes per arm pit. A stick will last me a few months on average. We use Zum / Indigo Wild spray often on our bodies too. They’re a Kansas City based company that makes all kinds of great scented products. Our favorite Zum scent is Frankincense and Fir. Doing laundry on the road is not our favorite thing, so we actively prevent our clothes from smelling bad. Layers are key here, we peel off layers when we get hot so our body doesn’t have to sweat. We’re currently in the desert, so I’ll often be shirtless when it’s hot. It’s easier to wash my body than it is clothes. After I wear my clothes, I will hang them out in the sun. This dries them out and prevents them from stinking pretty well. We also choose materials that are antimicrobial or easy to wash. Merino wool is an excellent base layer for this reason. 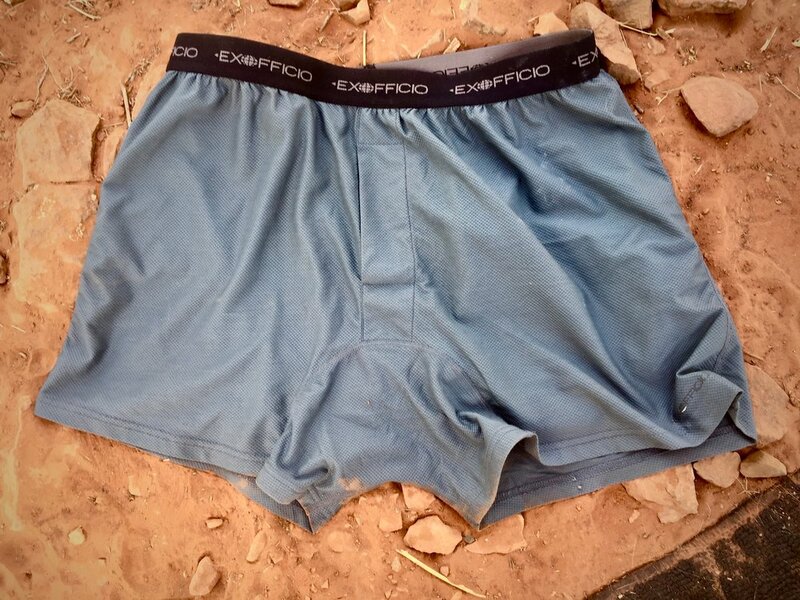 Another garment that I love is the ExOfficio Boxers. These are great because I can wear them for several days and they don’t hold a smell. When I do need to wash them, I’ll put them in a tub with some Bronner’s and rinse them out. They dry super quick so washing them is a breeze. When we do need to do laundry, we’ll often use laundromats. Depending on location, we use laundromats maybe twice a month. Mostly to wash our bedding. Although I prefer to sleep naked, we sleep with some clothes on to keep our bedding from getting gnarly. Base layers are easier to wash than blankets. When water is plentiful, we do our laundry in a rubbermaid container. Throw the clothes in, dump in enough water for the clothes to soak, add a bit of Dr. Bronner’s, squeeze and agitate the clothing. Dump out the water, add a bit more water and rinse. Repeat if necessary. Then hang the clothes up on a clothes line. Pretty simple when plenty of water is available. Like I said above, we’ve come across generous people that welcome us to do laundry at their houses. The key here is to be nice to all the humans, many will we be helpful in return. Diet is key to having predictable poops. I generally #2 once a day, and sometimes I’ll skip a day depending on how much I’m eating and activity level. We often camp close enough to town or campground toilets to use those. If there’s no toilet nearby, we’re normally deep enough into the wilderness to poop in the woods. To prepare for my cleanse quest, I grab our shovel, about 5 squares of TP and a lighter. Our shovel is awesome. It’s meant for prospecting so it has a pick and shovel built in. It folds down to the size of a small book and fits in my pocket, which is great for low key dumps. Having a quality shovel that can move dirt quickly is particularly handy in dire situations. We bought this shovel at a prospecting store over a year ago for $13. I’d suggest getting something like this over the little garden shovels often sold for this job. Once I’ve arrived in a prime and secluded spot, I dig a hole. The general rule is 6” deep, but I generally dig a bit deeper so it’s harder for animals to dig up. This is where the prospecting shovel and pick come in handy, I can break up rocks or hard ground easily with the pick. I then squat over the hole and deposit my gift to the earth. Now that I’m used to squatting to do my business, I much prefer it. The squat makes for quick evacuation. I then clean up with the biodegradable TP and toss it in the hole. Then I light the TP on fire. I do this because I often see toilet paper scraps in heavily trafficked areas. Lighting the TP just leaves the bioavailable waste to be assimilated back into nature. I then push the loose dirt back over the hole and throw a rock on top. When I get back to the scamp I clean up a bit more with a baby wipe. I would take the baby wipe with me, but they don’t burn or degrade very well. This all may seem archaic, but it’s not a big deal at all once you get used to it. Keep in mind that our species has been doing all this in an even simpler way for many years.